My mom received a definitive diagnosis last week. My sister drove us the two-hour drive to mom’s appointment for a PET scan. We were very fortunate to have an appointment just five hours later to receive the results, a benefit of her being enrolled in a research study that would be used to help prove the benefit of an early PET scan in the diagnosis and treatment plan for patients with dementia symptoms. An hour into the drive, I noticed how quiet mom had been and turned to the backseat to ask how she was feeling. “Like I’m being used,” she said angrily. She explained that she didn’t know why she needed to have the test done just to help out future patients who might benefit from her test. “The doctor wants it, or you do?” she answered. It was a good question. I did want her to have the test. Why did I? I was conflicted. I believed it was important to have as much information as possible for mom to receive the best treatment possible, but I also knew it was unfair for me to push for what I’d do in her place. I prayed the rest of the drive. Lord, what should we do? Take over. Let things go according to your plan. I believe God led us through that day according to His plan. Mom seemed comfortable, even napping during the procedure. When we received the results, the doctor was able to tell my sister and me the diagnosis while explaining it to mom in a way that left her calm and upbeat about her future. Somehow the doctor was able to communicate with mom on one level and my sister and me on another, giving each of us just what we needed to keep going. A diagnosis helps prepare us for what lies ahead. Although no person experiences an illness exactly the same, there is still a possibility of knowing what can be expected in the years ahead. Some people don’t want to know about the future difficulties an illness can bring, but others like me feel better knowing what can be expected so they can prepare as much as possible. Knowing allows us to seek out others who have experienced the illness and find helpful ideas and support. A diagnosis gives reassurance to those who suspected the illness. I’d known something was wrong with my mom’s brain for the past year or so. The months of family discussions and medical appointments that culminated in the PET scan were not easy. I felt inner turmoil (“I’m just making a big deal out of nothing.”); there was initially disagreement from some family members (“This is just normal aging. Don’t talk with her about it; you’ll only upset her.”); and mom was resistant (“All my friends are having the same trouble. It’s just that we’re getting older.”). Having a definitive diagnosis eased the inner turmoil and helped get everyone on the same page. 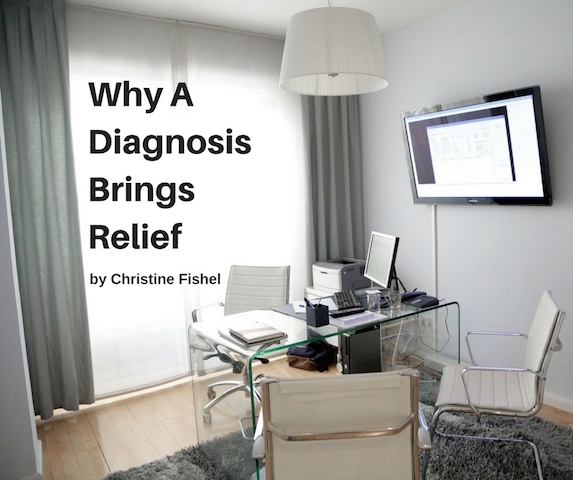 Exceptional doctors know how to give a diagnosis in a way the patient can receive it. My mom feared a diagnosis. The way her doctor explained her diagnosis was a gift to my mom and to my sister and me. It eliminated fear for mom while giving us the information we needed to best prepare for her care. I look back on that difficult day and am grateful for one thing above all: God’s guidance. By trusting Him to take us through the day, we were able to spend moments being silly and laughing. We were able to hear what we needed to hear in the way we needed to hear it. And we were even able to find joy in eating an ice cream cone together on the drive home.